We are getting right back where we started from here at Boot Campaign in this 10-Year season of celebrating. That involves something new, fun and innovative with our friends we love at Altama! The special Limited Edition Boot Campaign Branded 10-Year-Anniversary Boot commemorates 10 years and over 30,000 pairs of boots that have passed through our doors. While lacing up my new Altama Maritime Assault boots this morning the catchy tune by Maxine Nightengale started playing on the 70’s hits playlist blaring from the living room. That little ditty sums up a decade-long relationship with Altama, now part of the Original Footwear family. Altama was the first company to work with Boot Campaign to realize a dream of activating grateful Americans with a product they could purchase and wear that would not only turn heads and start conversations but send a message to military that “we see you, and we appreciate you.” We took an already known product in the military and branded the heel with the Boot Campaign logo. At that time online ordering capabilities were only emerging into what it is today, so we had to purchase inventory of boots and lease warehouse space to fulfill orders. Storing combat boots takes a whole lotta of space! Over the years we’ve added multiple partnerships with all of our amazing military boot suppliers, many of whom have been with us nearly as long as Altama. In order to capitalize on this special edition, one-time only boot, we are taking pre-orders to meet a minimum requirement for production. Retail for the boot is $100. You can be one of the first to get your pair of Anniversary Shoes by pre-ordering your pair today. Delivery time for these one-of-a-kind boots is targeted for early September; just in time for our 10-year Lace Up, America initiative that launches November 1st! We invite you to celebrate with us and how far we’ve come along! 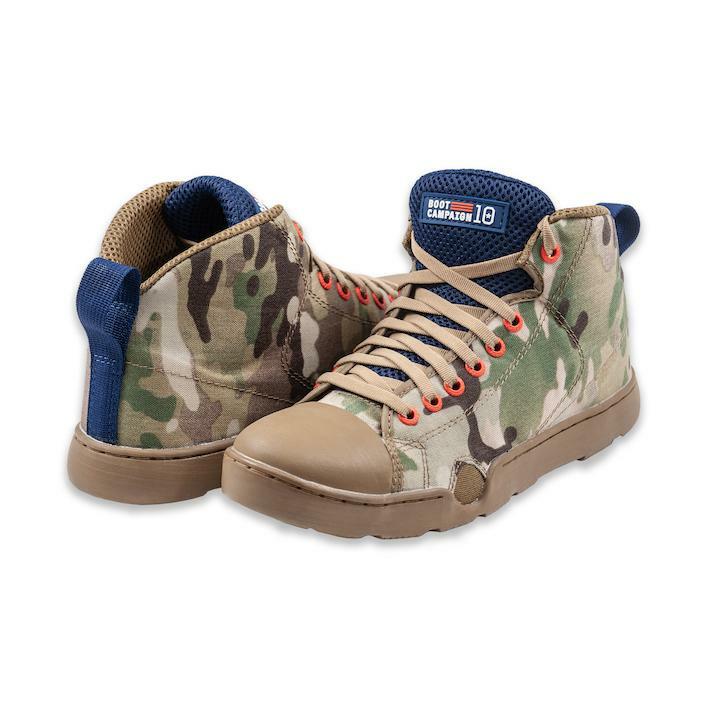 Pre-order yours by clicking here and shopping in our online store at Shop.BootCampaign.org.